Summary First-to-market HomePlug AV2-MIMO adapter based on Qualcomm's QCA7500 chipset. Yes, folks, the wait is over. 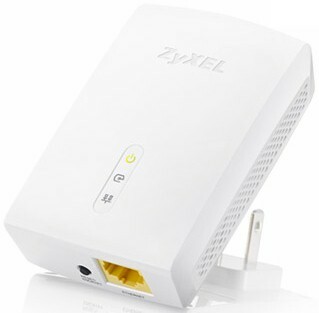 ZyXEL has finally released its first-to-market HomePlug AV2 MIMO powerline adapter, the PLA5405 1200 Mbps Powerline Gigabit Ethernet Adapter. The new ZyXEL is available only in a kit of two as the PLA5405KIT and currently only from NewEgg, which has priced it at $140. Referring to the HomePlug AV2 profile chart below, the PLA5405 is classed as a 1 Gbps MIMO adapter. But given that ZyXEL branded the SISO - 750 Mbps class PLA5206 [reviewed] as "1000 Mbps", they sorta had to bump up the 5405's number on the box, too. I didn't ask ZyXEL for its justification of the 5405's "1200 Mbps" number. You're not going to reach anywhere near that throughput anyway. You'll find the 5405 and other adapters of its ilk classed as AV2-M1000 adapters in the Powerline Charts, Finders and Rankers. The PLA5405 is larger than lower-class compact adapters like TP-LINK's TL-PA4010KIT [reviewed]. But it's essentially the same size as the PLA5206; 90 x 60 x 27 mm (3.54" x 2.36" x 1.06") vs. 93 x 61 x 32 mm (3.66 x 2.4 x 1.26). Its three-prong plug positions the adapter body so that it won't block the adjacent outlet in a standard U.S. duplex, as shown in the photo below. The serial number label specs a 100 - 240 VAC 50 / 60 Hz operating range. The callout diagram below (reused from the PLA5206 review) shows the adapter supports tri-color HomePlug link quality indication. The single Gigabit Ethernet port is centered on the bottom side of the adapter, with the Reset / Encryption button sitting to its left as shown in the opening product shot above. The User Guide says the adapter goes into power-saving mode after 60 seconds of Ethernet inactivity and powers up again when activity resumes. I verified this by the following procedure, which ran fine. Waited until the Ethernet unplugged PLA5405 entered power-save. Plugged Ethernet back in and verified that adapter powered up and ping returns resumed. ZyXEL swung back over to the Qualcomm side after using Broadcom's BCM60333 in the PLA5206. The PLA5405 is the first sighting of Qualcomm's QCA7500 HomePlug AV2 MIMO IC. The block diagram and spec below grabbed from the QCA7500's data sheet confirm the 2-68 MHz frequency band that earns it a 1 Gbps MIMO classification. The inside photo shows the QCA7500 at the upper center. That's an AR8035 Gigabit Ethernet PHY near the yellow RJ45 jack. There is no separate analog front end (AFE) device; that function is built into the QCA7500. The User Guide references a PLA Series Configuration Utility. But there is no CD in the box that contained only documentation and the utility wasn't found via Support searches for either PLA5405 or PLA Series Configuration Utility. My experience has shown these utilities are of little use anyway. I've yet to find a powerline device that had any updated firmware to be installed. And the QoS configuration screens are not user friendly and have no useful documentation. The only possible use is to check link rate, which again, I rarely find provides an accurate reflection of the actual throughput of a powerline connection. I tested the PLA5405 using our standard powerline test procedure, with all results entered into the Powerline Performance Charts. Since this is the only AV2-M1000 class device, I took the approach of comparing it to three products closest to it in the Powerline Charts, ZyXEL's PLA5206 (AV2-S750), TP-LINK's TL-PA6010 (AV2-S500) and ZyXEL's PLA5205 (AV2-S500). The Downlink Throughput plot below clearly shows the PLA5405 having the highest throughput only in the best-case same-outlet Location A. The 5405's 333 Mbps is 25% higher than the next-best TP-LINK TL-PA6010 with 267 Mbps. But the plots show the 5405's advantage doesn't carry into the medium-range location C test, where it is beaten by the TP-LINK. And in worst-case Location E, all but the AV2-S500 class PLA5205 are about the same between 102 and 108 Mbps. Uplink results show a similar pattern. The 5405 is best in Location A with 351 Mbps, but drops to next-to-last position in Location C and runs with the most of the pack in Location E.
The simultaneous up /downlink IxChariot plot for the PLA5405 shows uplink favored over downlink by almost 2 to 1. But there is cyclical variation and the two streams appear to be slowly converging. Note throughput totals almost 420 Mbps! Adding more simultaneous streams adds a bit more bandwidth. With two up/downlink streams running simultaneously, total throughput moves up around 5% more to 440 Mbps. Note that uplink in each of the pairs is still favored over downlink. Note also that throughput is fairly evenly distributed between the two streams in each direction. The Location E noise tests I've been running have proven interesting, so I ran 'em again. Location E is where most of my worst powerline noise sources (our smartphone and tablet chargers) live. The tests basically plug and unplug a particularly noisy wall-wart while an IxChariot stream is running and compare the results to a stream with all noise sources unplugged. The composite plot below compares the baseline Location E downlink test, run with all noise sources unplugged with a run with the noise source plugged in then uplugged at the 30 second mark. Throughput recovers to the maximum no-noise-source value within 30 seconds. I also ran a test with all noise sources plugged in to see the adapter would try to compensate. The jump in both plots just after 10 seconds is IxChariot's Nagle algorithm quirk. After that, there is no sign of any attempts to improve throughput. There's not much sense using the Powerline Ranker to sum up, since the PLA5405 currently stands alone in its AV2 MIMO-1000 class. So let's look at the Powerline Charts' average down and uplink values for all AV2 SISO & MIMO products. It's clear that the PLA5405 has the highest average throughput for both up and downlink. But with only 10 - 13% higher average throughput for 2X the cost, it's not a cost-effective choice. TP-LINK's TL-PA6010KIT still seems the clear choice if you need a pair of HomePlug adapters today. Guess we'll have to see if TRENDnet does any better when it ships its long-delayed TPL-420E2K AV2-MIMO kit.